Barcelona goalkeeper Marc-Andre ter Stegen has compared Mesut Ozil with Lionel Messi due to his ability to do the “unimaginable”. 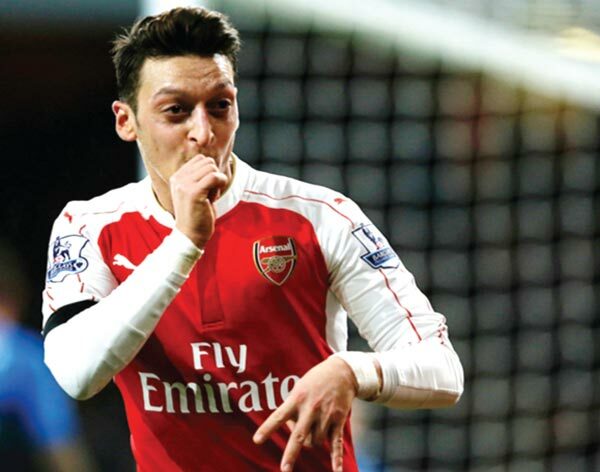 Having been criticised for his inconsistency in the past, Ozil has enjoyed his finest season to date with Arsenal, registering seven goals and 19 assists in all competitions. And Germany team-mate Ter Stegen says Barca will have to be wary of the threat posed by the former Real Madrid man when they host the Gunners in the Champions League last-16 second leg today. “As a player, he can do unimaginable things, just like Messi,” he said. “He’s exciting, I’ve played with him two or three times and he’s a very significant player for the German national team. “We’ll need to be alert tomorrow to make sure he doesn’t harm us. “It’ll be a very difficult game tomorrow because we got a good result in the first leg, but that doesn’t mean we’re in the quarter-finals. Two goals from Messi secured a 2-0 win for Barca in the first leg at Emirates Stadium.